Does anyone have any experience with the model or brand? Any other (affordable) recommendations? I had a Deuters Pack - the very same one you are looking at and found in very comfortable and very 'user-friendly'. One drawback depending on how you look at it is that it is very long. But the shoulder straps are completely adjustable which helps. I would buy one again. Did quite a few big trips with it and it survived very well. Unfortunately it has since been redistributed through no choice of my own. Deuter is VERY popular in Germany (maybe cause it’s a German brand?dunno) I don’t own anything from them, but a mate of mine has a rope bag and sleeping bag from them and no complaints. Dunno about the particular backpack you’re referring to, but the Deuter guide 45L is rumored to be the best Alpine backpack. I’m sure you can expect excellent quality, could be expensive though. Yup, got a Deuter hiking bag, its been through most airports, the better part of Spain, France, Vietnam and China and still as good as new ... 2 years later. Hi, Deuter is Europes largest and leading brand of packs and bags and as such make awesome products. Unlike some other packs available, they are relaly solid and durable and work like a dream, I have one of their daypacks and hiking packs. In SA, they are also well priced when compared to european pricing. I have had a Deuter 35+10L Alpine pack for a couple of years now and I am very happy with the product. The materials used are strong and durable and the design is well thought out and comfortable. I have used my pack for all sorts of climbing from day trips to the Magalies, ice climbing in the Berg to a trip up Giants Castle. A friend of mine has the 65L pack and is also very impressed with the product. Compared to other imported models, it is very well priced. Thanks for all the replies chaps. I think Deuter it is! To elaborate on the plan: my wife and I are back-packing through Peru for a month in May, and I decided to stop borrowing packs from friends and family and spend some bucks on two new packs. But I kinda want packs that will do for backpacking, hiking, etc. A pack-of-all-trades so to speak (sorry, couldn't resist! ). The only reason I picked the 65+10 is because I previously used my old man's 65l Seaking on trips and it was fine. Should I go bigger or smaller? The plan is to buy a smaller pack for my wife, so I had been thinking one 65+10 and one 50+10. Packing is easier, simply dump everything in and not have to worry about arranging things to ensure they all fit. You can usually use the compression straps to make the pack smaller. Bigger ensures that you will almost always be able to fit everything in. Smaller means sometimes having to strap things to the outside of your pack. Bigger means that the chance of packing too much increases exponentially with increasing pack volume. You have been warned!! I tend to aggree with o0dball. If you can't fit it in your 65L pack, then you probably don't need it anyway. For a trekking trip you won't need all the gear you would require the extra packing space for like on a climbing expedition. I’m the proud owner of a Boulder 75l from Backpacker. I agree that the big volume encourages you to pack stuff you don’t really need, but if you do, then you’ll be grateful for the extra volume. Exercising some self discipline and just packing the things you need is the answer. When the compression straps are at there limit, I pack extra towels to fill the empty spaces. It’s always good to have a couple of extra towels and they don’t weigh that much. My favourite is a Back Packer Thar 95L, lank space. It goes everwhere. Rather have capacity than struggle. I don't like wearing climbing gear on the aproach. \"Should I go bigger or smaller? The plan is to buy a smaller pack for my wife, so I had been thinking one 65+10 and one 50+10.\"
She takes all the bulky stuff like sleeping bags therma-rests and tent and clothes and I get all the trad gear ropes and food. 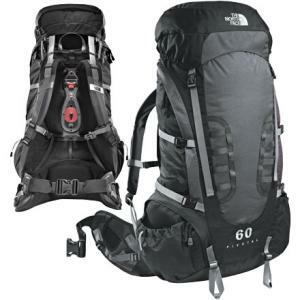 I would not recomend a smaller pack like the 50l for the misses get the same size for her or bigger all the bulky stuff is light! Ja, I suppose getting a bigger pack you can always just not fill it. And then just be careful not to over-pack! What do you make of these \"women's fit\" packs? Deuter offer a SL fit that is for women. Much difference? Any reason not to get one for the missus? I recon most of it has got to do with the size of the waist belt; and perhaps the length of shoulder straps. 90% of a backpacks comfort is in the constuction of the waist belt. Make sure its the right size; alot of packs these days have interchangeable belts. So if the pack you get isn't the right size all you may need to do is send the waist belt back?? I got a rather fancy North Face Pivotal which set me back by a few grand but my goodness, is it comfortable 35kg packed into that thing feels like 25kg in my Backpacker. Know of any good guides to backpack fitting? I know next to nothing about how the thing should fit, where on the hips it should sit, etc. And I don't trust the guys in the store to know either! Unless your pack fits properly, it won't feel right, even if it's supposed to be the Rolls Royce of backpacks. Follow the guidelines below to achieve pack-fitting Nirvana. How tall you are has no relation to what size pack suspension you will wear. It's the length of your torso that counts. Folks over 6 feet sometimes fit only into small suspensions. Conversely, folks 5 feet 6 inches tall can wear large suspensions. You'll need a friend for this. First, find a soft tape measure (the kind a seamstress uses). Next, have your friend put a piece of masking tape on the seventh vertebrae ( the bony protrusion at the base of your neck between your shoulders). Now find the point on the small of your back that is exactly level with the top or shelf of your hipbones. You can help your friend here by sliding your hands down your side until they rest directly on top of your hips with your thumbs pointing inward. Tell your friend to be sure your thumbs are marking a somewhat straight line toward your spine and then have them place another piece of tape on this point. Using the soft tape measure, place one end on the seventh vertebrae and, following the contour of your spine, have your friend read the measurement where the tape measure touches the tape mark on your lower back. Write down the measurement. If your torso length is less than 18 inches, you're most likely going to fit best into a small size suspension. If your torso length is between 18 and 20 inches, you're most likely going to fit best into a medium suspension. If your torso length is over 21 inches, you're most likely going to fit best into a large suspension. Hipbelts should cup your hips and be sized so when you cinch them tight, there is still a bit of webbing left and the pads do not touch. Women with straight or narrow hips will fit fine in a standard waistbelt. Individuals with more curve to their hips will need a woman's style waistbelt. Shoulder straps should anchor to the backpack just below the seventh vertebrae and the crest of your shoulders. From the back, they should wrap comfortably, but securely around the shoulders with the bottom of the strap padding ending no closer than five inches below your armpit. Sternum straps are meant to keep your shoulder straps from sliding off your shoulders under a load. They are not meant to support weight and should never be pulled tightly enough across the chest so as to restrict breathing. Load-Lifter straps on the shoulders should form a 45 degree angle from the frame or top of the pack to a point on the shoulder strap at or above your clavicle (see, that anatomy class in High School is now paying off, isn't it! ).